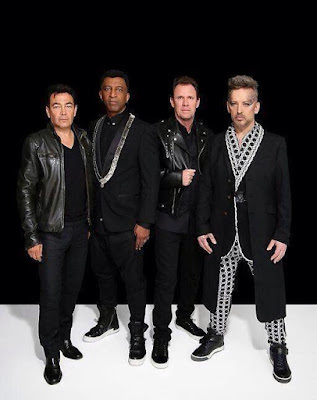 This is the first time that Boy George and Culture Club (with members Mikey Craig on bass guitar, Roy Hay on guitar and keyboards, and Jon Moss on drums and percussion) will be performing in the Philippines. Those who grew up in the eighties as well as music lovers are excited for this news and can’t wait to see them perform their greatest hits. "This is one big party," says George when asked about the concert. Though it’s a given that a lot from the LGBT community will flock to the Big Dome to see this show, many believes that Boy George and Culture Club’s music appeals to everyone because of its poetic lines and universal message. Over time, George acknowledged that the audience has evolved. "When people would ask 'Who’s your audience?’ I’m like 'Everyone.’ It literally can be young kids, to very old ladies, you know moms," he said. "It used to be a lot of girls back in the days, and now we seem to get a lot more guys." 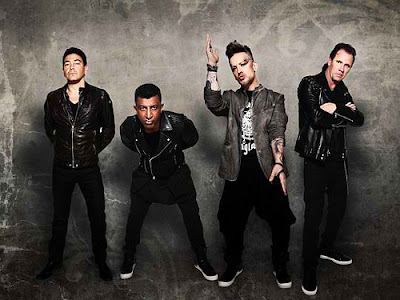 As the first multi-racial band with an openly gay front man, Culture Club has set many records, including being the first band since The Beatles to have three Top Ten hits in America from a debut album. In the eighties, the band dominated the charts in over a dozen countries, with multi-platinum albums and more than 50 million albums sold worldwide to date. In 2014, Culture Club reunited to create new music and has been in the studio putting the finishing touches on their new album Tribes, available now for pre-order, set to release later this year. The band recently headlined iHeart Radio’s 2016 "iHeart 80s Party" at The Forum in L.A. to a packed crowd. If there is one concert you shouldn't miss, this is it. Get ready to dance and be in your best party get up. It would be more exciting if you come in full-on Boy George attire. You might just be the lucky person to dance with the pop icon on stage. 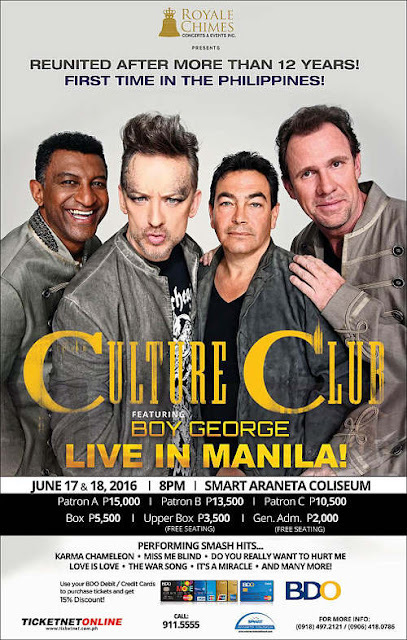 Culture Club Featuring Boy George Live In Manila is a production of Royale Chimes Concerts & Events Inc. Tickets are now on sale at Ticketnet (63 2) 911-5555 or log on to ticketnet.com.ph. You can also use your BDO credit and debit card to purchase tickets and enjoy a 15% discount. For more info, call (63 918) 497-2121 and (63 906) 418-0786.